In the heart of this mildly cold winter in LA, it is nice to be able to hunker down and make a nice home cooked meal. There are always delicious take out or delivery options for Thai food or Chinese food, but I prefer to recreate my favorite dishes using healthy, fresh ingredients. Restaurant food always uses an excess of salt, sugar and oil in their food. I try to cook with healthy oils like Coconut Oil, Organic Sesame Oil or Organic Olive oil and I use Tamari instead of sodium ladened Soy Sauce. 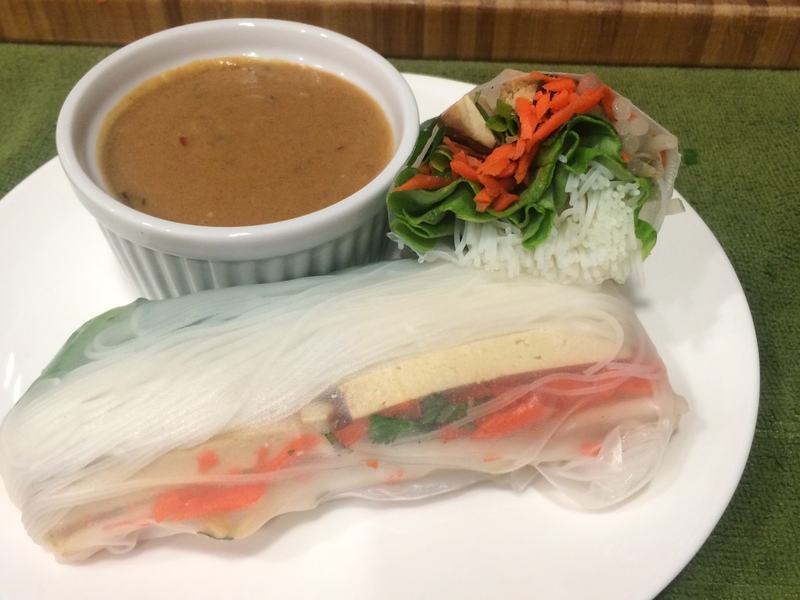 Tonight I am making Paul’s favorite, Fresh Spring Rolls with Tofu and Peanut sauce, to go along with my standard stir fry vegetables and quinoa. You can find the recipes for the Stir Fried(Steamed) Vegetables and Peanut Sauce on my most recent post. You will need to go to the grocery Store to pick up a few special ingredients for this including Spring Roll Skins(found in a clear plastic, frisbee like container), Rice Stick noodles (I used Maifun brand), and some kind of marinated pressed tofu (I used Wildwood Teriyaki flavor). Other than these three, the rest of the ingredients are pretty straight forward. 1 Package Pressed, Marinated Tofu- Cut in long slender rectangles. Measurements are dependent on how many rolls you are making and how thick you want them. Prepare all your fixings and place in individual bowls, easy for grabbing and placing on your spring roll. First you will want to prepare your noodles, simply follow the instructions and let cool for a few minutes. Next, make sure you have a good, clean area to work. Clear off counter space and place all your bowls filled with fixings close together. For the Spring Roll skins you will need a deep plate or serving dish, just deep enough for a small amount of water. Get a clean, dry dish towel and place it on the counter near your fixings. Warm some water, place on plate, take one skin and submerge it with your hands, make sure all the surface area is under water. Hold under for approximately 10-15 seconds. The skin will become extremely malleable and completely translucent. Pick it up with two hands and lay it flat on to the dry dish towel. Smooth out any wrinkles and voila you are ready to roll. There is no perfect way to fill a spring roll. If you are a big fan of basil, load it on, if you hate sprouts, leave them out, if you are an uber healthy no carb fiend, the leave the noodles off (although I don’t recommend that because they are delicious). Just start with a fixing and start piling it in, just remember that the skins are fragile so you can’t pack too much in. Once you have filled your roll, very gentle mash all the ingredients with your thumb and other fingers. Take one side of the skin and roll away, while pushing the filling in simultaneously, think rolling a burrito, enchilada or Bouche De Noel. Slice in half, serve with Peanut Sauce or your favorite dipping sauce. I always put out the Sambal (Chili Sauce) just in case anyone wants an extra kick. This is an excellent appetizer or entree lunch. Enjoy! Our delicious Asian Feast, complete with Asian Bowls (Quinoa, stir fried vegetables and Spring Roll Fixings) and one of my favorite green teas, UCC! Such a delicious, satisfying and healthy Vegan meal.